Snake design neck chain in Gold plated finish over Sterling 925 Silver. Excellent 460mm (18inch) Snake Chain with the last 50mm in extension open belcher style chain. Extension part of the chain allows it to be worn as between 410mm - 460mm length (16inch - 18inch) making the chain more versatile. 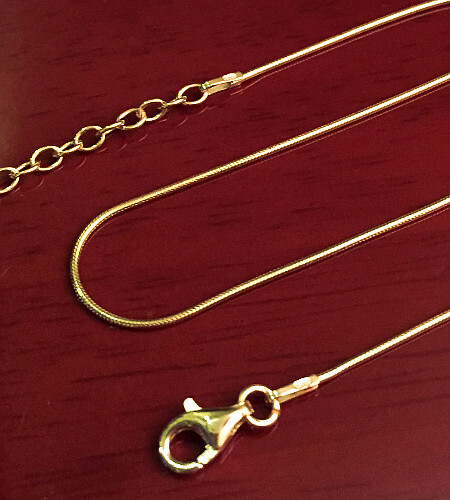 Quality Yellow Gold plated on Sterling Silver base Chain. Quality Gold plated 925 Silver Lobster type Clasp. Details: Last 50mm of length is Extension 3mm gauge Belcher link Chain, Lobster Clasp attached.